Hope you all had a wonderful holiday season and a Happy New Year! Though I did a lot of cooking and baking the last couple weeks, I didn’t get around to posting much since the holidays are always so busy. I wanted to share a bread recipe with you that I made over the holidays. I was lucky to receive a dutch oven for Christmas (thanks Roseann!) and I’ve already put it to good use baking bread twice. 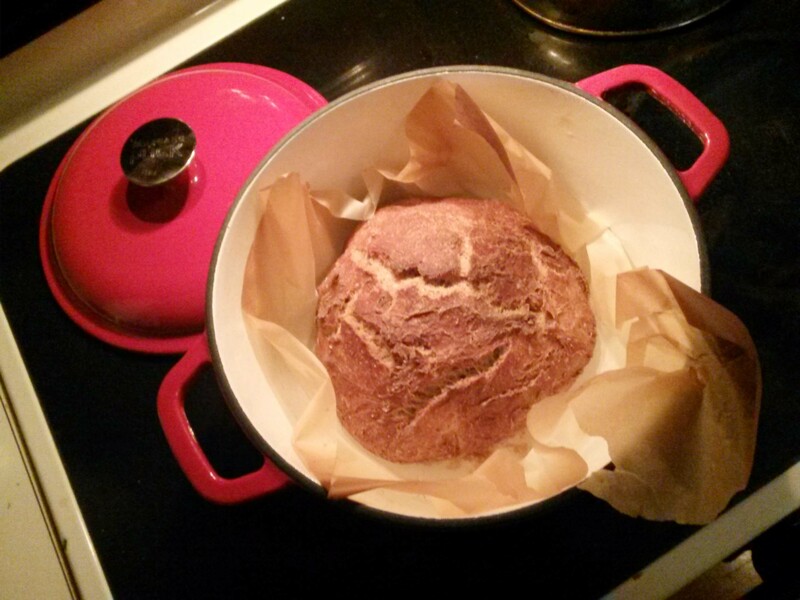 I’m seriously addicted to no-knead dutch oven bread now. This might become a weekly thing since it takes so little time, and it’s really nice having fresh homemade bread around. This recipe is one that my sister shared with me that originally comes from Breadtopia and is called Rick’s No-Knead Rye. We made a few small changes to the original recipe. It turned out really well! The crust is nice and chewy from baking in the dutch oven and the inside is a nice soft texture. It’s not as airy and light in the middle as some other no-knead bread since it doesn’t have as much yeast as other recipes, but this makes it a great choice for sandwiches! If you haven’t made no knead bread before, take a look at my Artichoke and Roasted Garlic Bread Recipe first. I compiled links and information about dutch ovens and other baking options, how steam helps in the baking process, etc. In a large mixing bowl, combine the yeast with luke warm water and a pinch of sugar. Allow the yeast to proof for 5-10 minutes. Add the flours, salt, and caraway seeds. Stir until all ingredients are well combined and formed into a dough. Cover the dough with a kitchen towel and let it rise for 12-18 hours on the counter. Turn the dough out onto a piece of parchment paper and gently form it into a loaf. Set it aside to rise for another hour or so. Place a dutch oven in the oven while it’s cold and preheat the oven to 500°F. Place the parchment paper and dough into the dutch oven and cover. The parchment paper makes it easy to transfer the dough into the hot dutch oven and it keeps the bread from sticking to the bottom. Bake the bread covered for 30 minutes. Then uncover the bread, lower the temperature to 400°F and bake for 15 more minutes. Once the bread is done baking, turn the oven off and let the bread sit in the oven an additional 15 minutes. Let cool, and enjoy! It’s so hard to find good tomatoes these days. I’m not sure why that is. I remember summer tomatoes when I was a kid that were amazing. They were full of flavor and we would eat them on their own with a little sprinkle of salt. Of course, my parents grew tomatoes in their back yard so that’s probably why they were so good…they were perfectly fresh and ripened on the vine. The tomatoes that you find at the store or even at farm markets often don’t taste like much and don’t really compare to the ones I remember. However, a little while back I did find some at Whole Foods that were grown at a local farm, and they were the best I’ve had in a long time. If you have some end of summer tomatoes and are looking for a good recipe, this is a classic dish that really showcases the tomatoes. It was also a good way to use up some of my basil. I grew it from seed and it’s finally growing well after staying kind of scrawny all summer. It’s in a sunnier spot now which it seems to enjoy. With bread, fresh basil, and tomatoes, it’s hard for this recipe to go wrong! Cut the bread into large cubes. If the bread it still soft (mine was even after a couple days), preheat the oven to 400°. Place the bread cubes on a baking pan. Drizzle a little olive oil over top and sprinkle on salt, black pepper, and garlic powder to taste. Bake the bread cubes for 5-10 minutes until they dry out a little bit. If your bread is still soft and you skip this step, the bread will be really soggy once it soaks up juices in the salad. 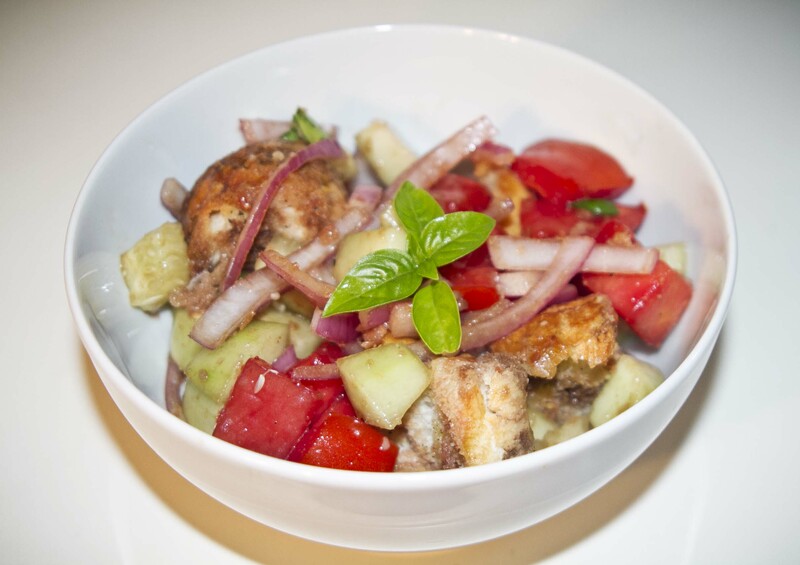 Chop the tomatoes, peel and chop the cucumber, and thinly slice the red onion and basil. Place all the veggies in a large mixing bowl. Once the bread is finished toasting, add it to the bowl and mix it up. Drizzle on a little olive oil and balsamic vinegar and sprinkle on some salt and pepper to taste. Stir so everything gets evenly coated and serve right away. This salad is best eaten the same day it’s made because the bread will get soggy in the fridge overnight. Vote for your Favorite Virtual Vegan Potluck Recipes! If you haven’t voted for your favorite recipes in the Virtual Vegan Potluck, go vote now! You still have a few more days to get your votes in. Of course I would appreciate a vote for my Chocolate Peanut Butter Pie with Fresh Berries, but you should pick your favorites! There are so many recipes that look delicious! If you have the time, I recommend making your way through the whole potluck, because there are lots of great recipes. But if you’re short on time (there are a ton of recipes and it takes quite a while), I thought I’d share just a few of my favorites in each category, as other VVP bloggers have done. It’s really hard to narrow them down, but I thought it might help in your voting process if you don’t have time to go through all the recipes. Vegan Fling: Artichoke & Chickpea Salad – This is the first recipe from the potluck that I tried making, and it was really yummy! Desserts: This was the biggest category and obviously the hardest to narrow down based on the number of links I’m sharing! Hope you enjoyed the recipes, now go vote! With St. Patrick’s Day coming up, I decided to veganize an old favorite, Irish Soda Bread! There are many variations on Irish Soda Bread, some more traditionally Irish, and some more Americanized. I’m not sure exactly where this lies on the spectrum, but it is tasty! I started with the Irish Soda Bread recipe from Simply Recipes, posted by Elise Bauer, and then made my own adjustments. This recipe is not very sweet, but I liked it that way. If you want it sweeter, you can add a little more sugar. The texture of the bread came out perfect, dense but also fluffy like a scone. There’s also a variety of things you can add or leave out based on your preferences, including raisins, currants, caraway seeds, lemon zest, orange zest, etc. I included raisins and lemon zest. I meant to put caraway seeds in as well, but I forgot to add them, despite making a trip to the store to buy them before I started baking. Sigh. I’m including them in the recipe anyway, in hopes that I remember them next time! If you’re looking for other Saint Patrick’s Day recipes, check out the recipe for Vegan Irish Potatoes that I posted last year! 2 lemons – I used Meyer lemons, which are a little smaller than regular lemons. Preheat the oven to 425°. In a large bowl, combine the flour, sugar, salt, and baking soda. Cut in the vegan butter using a pastry cutter or a fork. It will form course crumbs in the flour. Add your raisins to the mix. In a small bowl, whisk together the egg replacer powder and warm water. Zest and juice your lemons. In a small bowl, whisk together the soy milk and 2 Tbsp of the lemon juice. This creates a vegan version of buttermilk. Make a well in the center of your dry ingredients. Add the egg replacer mixture, the vegan buttermilk, the lemon zest, and the caraway seeds. Stir the dough until just combined. It will start to pull together into a rough ball. Coat your hands lightly with flour and knead the dough gently. If it’s really sticky, add a little more flour, though this dough is meant to be sticky and rough, not smooth like a yeast bread dough. Don’t over-knead the dough or the bread will be tough. You just need to get it into a ball that you can transfer to a baking pan. Line a baking pan with parchment paper if you have it, or lightly grease the pan. Transfer your ball of dough to the pan. Score the top with a large X.
Bake the bread for 35-40 minutes. I checked it with a chopstick to see if the center was done. If the chopstick comes out clean, it’s ready. Happy St. Patty’s Day! Happy New Year! I hope you all had a good 2012, and if not, I hope 2013 treats you better! Last year, my New Years Resolution was to learn how to make bread. I’m happy to say I feel like I’ve accomplished that goal. Sure, there will always be more to learn about breadmaking, but I’m feeling more confident about my ability to make a decent basic loaf of bread. This year, I think my New Year resolution will be to try new ingredients that I’ve never used before. It’s easy to get stuck in a rut and use ingredients you are comfortable with, but I’m hoping to branch out and learn to cook new things. But before we move on to 2013, here’s a send off to 2012’s resolution. This isn’t an entirely new recipe, but one that I repurposed to recreate a yummy flatbread pizza. American Flatbread has a new vegan pizza which I got at Whole Foods. I’ve been told it resembles Papa Johns Cheese Bread pretty closely, though I’ve never had it myself. I wanted to try creating a similar version at home that would be cheaper since their frozen pizzas are small and a little pricey. It turns out the vegan naan recipe I posted a while back makes really yummy vegan cheesy bread! It’s perfect for a New Year party, and you still have time to get the dough started! Happy New Year everyone! Follow the recipe for making naan dough. It’s a very easy recipe, but it takes 1 1/2 hours to rise and you also have to roll it out, so factor in that time. When you get to the step where you are rolling the dough into balls, create a baseball to softball sized ball rather than a golf ball sized ball. Once the dough is finished the second rise, roll it out fairly thin (about 1/4 inch thick or slightly thicker is good). Heat your skillet over medium high and drizzle in a little olive oil. Cook the naan on one side for 2-3 minutes until bubbles brown, then flip the naan to cook the other size. As the other side cooks, sprinkle garlic powder, salt, dried basil, and dried oregano on top of the naan. Then sprinkle on Daiya cheese. Lower your heat slightly so the naan doesn’t burn. Cover the skillet with a lid so the Daiya melts. Once the daiya is melted, transfer it to a plate or cutting board and slice. This makes a perfect side to a nice bowl of homemade soup! Also, here are a few of my bread making adventures from the past year, in case you missed them or want to look back. I didn’t set out to make rye bread. I was trying to make pumpernickel by following a King Arthur pumpernickel recipe, but I ended up with rye bread. I’m still on a quest for a good dark pumpernickel recipe, if anyone knows of one. Despite not turning out to be the type of bread I was expecting, this recipe actually was pretty good. I made this bread after a trip to the King Arthur store in Vermont. If you find yourself in Vermont, it’s worth a visit! I bought a bag of pumpernickel flour (which is whole rye flour) and followed the recipe on the back with a few small changes. This recipe can be made in a bread machine or by hand. I don’t have a bread machine, so I’ll give the directions for making it by hand. 2-3 tsp of caraway seeds. In a large mixing bowl combine the instant yeast with the warm water and brown sugar. The water should be warm but not too hot to touch. Let the yeast sit for a couple minutes. Add the rest of the ingredients and mix until cohesive. You can save some of the caraway seeds for the top of the loaf as well if you want. Allow the dough to rest for 30 minutes in a warm (but not hot) place. Knead the dough on a floured surface until it is elastic, but still a little sticky. This should take between 5 and 10 minutes. Leave the dough to rise in a covered bowl in a warm place for 1-2 hours until it is almost doubled. Preheat the oven to 425°. Lightly oil a baking pan and turn your dough onto the pan. Form it into a round or oval loaf. Make 3 slashes across the top of the loaf. Brush the loaf with a little water and sprinkle with seeds of your choice if desired. Bake the loaf for 18-22 minutes until the top is golden brown and it sounds hollow when you thump on the top. I went to Eataly the other day, which is right around the corner from where I work. It’s an Italian Market that has all kinds of imported food from Italy as well as lots of places to eat within the market. I picked up a loaf of bread while I was there called Mais, which is made with corn. It turned out to be pretty dry, and after reading up on it, it’s intended to be eaten with soup, stew, etc. so you can sop up the liquid. This makes it a perfect bread for making French toast. I’ve used bananas in the past to make vegan french toast, but I decided to try out apple sauce to replace the eggs this time. It turned out really well and the French toast ends up tasting like an apple cider donut. Perfect for fall! In a mixing bowl, combine the apple sauce, soy milk, flour, vanilla, cinnamon, nutmeg, and pumpkin pie spice. Whisk it until it’s fully combined without lumps. Slice your bread in thick slices. Soak the slices in the batter allowing it to absorb into the bread for a minute. Heat a skillet over medium heat. Melt some vegan butter in the skillet so the French toast won’t stick. Place the battered bread slices into the skillet. Keep an eye on it as it cooks and flip it with a spatula so both sides cook evenly. Vegan French toast will probably take a little longer to cook than non-vegan French toast, but it turns out best when you cook it slowly on medium heat. The French toast is ready when it’s crispy and golden brown on both sides. Drizzle with maple syrup and enjoy!